Jerry Moore nailed this recording from directly behind the soundboard. In such an intimate venue – a gymnasium – this leads to one of the finest AUD recordings we could hope for. You may as well place this on the shelf with other Grateful Dead “best AUDs ever.” Beyond the music being crystal clear, there is a tight packed feel to the energy of the crowd and band in such close quarters, and this becomes an unmistakable fuel for fantastic music. This show gets off to a great, high energy start with a Bertha>Good Lovin’. The peaks reach quite high, and the band seems fully charged. 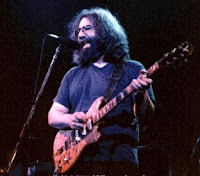 This continues on into the Brown-Eyed Women, and Jerry punctuates the last “Looks like the old man is getting’ on” line with a nice “Yes it does” to close the song. The set continues with emotionally charged renditions of song after song. The set closing Let It Grow should absolutely not be missed. A geyser of psychedelic energy, deep in the jam the song comes completely loose of its moorings and showers electricity in all directions, only to have the band perfectly return on cue for the chord change headed back to the final chorus. From there, the song escapes its cage again, firing itself around the crowd in warped directions. The music ties itself in liquid knots. 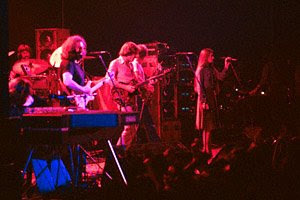 The drummers seem bent on leaving the song for space, and Jerry is completely outside of the song’s pocket. Unsurprisingly, they all gel back together perfectly to round things out. A great set closer. Returning for set two we get a playful band introduction from Phil which lends to the already intimate vibe on the evening. The set rockets of with a terrific Samson > Cold Rain. And then the meat of the second set begins. The Playin’ jam grows slowly, taking seed without Jerry for a number of minutes. Over a slow drawn out germination through a coolly swirling viscous ooze of psychedelic fog, the band explores a very contemplative space. It’s dark and roaming, like a silent midnight walk through ancient forests. Slowly the energy mounts and the rising sun begins to catch the dewdrops on leaves, casting a shimmering glow across the bark of trees drawing out hundreds of colors therein. Eventually triumphant, the sun bursts to fill the entire morning sky and the band flows beautifully into a very rapid tempo Eyes Of The World. Eyes absolutely gallops along with Jerry burning solos into the air, and the energy crackles. The intro solo subsides, then is followed by a slight return, as if Jerry needed just a little more. The first verse arrives and we are elevated into the splendor of the song itself. And, man, it is rocketing along at breakneck speed. When the first verse ends, and Jerry hits the solo again, he’s a bit louder, and the band notches things up just a bit more. Now things take flight locking into the satori-like pastures where we become one with the music. There’s less and less of anything else. The band has us right there with them. Verse two soars, and they go into the next solo section, elevating once again. Unable to conceive that there are higher levels to reach, Jerry blows every boundary clear out of the air, blasting a palpable energy into the crowd with the force of an exploding sun. The music rises. The crowd elevates. The music impossibly rises again. And pressing the limits of getting too much of a good thing, it does it again. That familiar feeling of giddy rapture overwhelms, and you can’t help but smile in the presence of exactly what brings you back to this band’s music time and time again. This is it, captured on tape – the fleeting magic moment that open your heart and fuses you into the soul of the band itself. It could be four minutes, or four million years. It’s both at once, and transcends the simple measure of time. This is that exact thing that our non-deadhead friends probably haven’t heard, and might unintentionally miss while you try to expose them to it. For sure, and for reasons we can only guess at, this is not for everybody. Estimated Prophet follows Eyes (the first time Eyes lead into Estimated instead of the other way around) and it’s good. But it is hard to compare to the previous song. It doesn’t matter. You can sense that the crowd is overjoyed just to be with the band now. Estimated casts its oily visions into the gym, and there is a haunted nature to the music akin to what was going on during Playin’. When the band tumbles over a ten story waterfall into Other One, the frenzy returns. The music captures you like snaking vines around your legs and arms, dragging you down to the planet’s core where rock is molten and gaining breath is impossible. It comes off like a magic trick because it is gone as quickly as it arrived, in under four and a half minutes. They go directly into Drums out of the first verse. Did they really just play Other One? 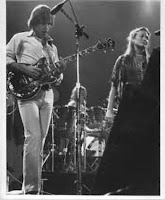 The rest of the show is vintage 1977 Dead including a fun Iko Iko and a glorious Stella Blue, with a very nice return jam into the Playin’ reprise. It’s all softly swirling rivers of muted lights and colors which eventually find the song capping off the jam in fine fashion. This recording provides a wonderful blend of capturing the essence of Dead show energy with near perfect recording conditions. Jerry Moore’s hall of fame status was already a shoe-in after his work in 1974. We can only thank him again for continuing to prove himself to be the taping perfectionist that he was. The guy knew what he was doing, and it is because of his efforts (and those like him) that we can even have these conversations about some of the more ineffable qualities within the Grateful Dead’s musical cannon. Another of my very first cassettes. Love it. "The intro solo subsides, then is followed by a slight return, as if Jerry needed just a little more." This reminds mr of that old cartoon in which Garcia is thinking "I'll just keep jamming until I remember the words..."
i don't know who you are, Icepetal, but i just wanted to leave you a few words of appreciation for what you do here. your writing in your show reviews is wonderful; you perfectly describe what i am feeling as well when i listen to the Dead's music. and, as much as it hurts to say it, you've changed my mind about audience recordings. i have close to (or maybe even over at this point, since i've started keeping years archived on my HD) 1000 hours of Grateful Dead shows in my collection, and most of which are SBD's. your work here has me reevaluating my love of crispy SBD's; maybe there's enough love to share with AUD's as well. Thanks, Sam. Bringing folks like you around to AUDs is just icing on my cake. Glad to have you along for the ride. I was at this show .seems like yesterday .we took the bus from the city . frat house party till rugby in the morning . one of the best weekends of my life . Super show, Homecoming Weekend in a college gymnasium, great energy that just flows back and forth from the stage, to the audience, and back to the stage again. A favorite tiny moment - Jerry drops beautifully into Stella, and just as he completes the first verse and sings "Stella Blue..." a delighted young woman's voice comes out of the audience to shout, "Yay Jer-reeee!!". Yay indeed. Awesome show and awesome site! Thanks man. Well done. An interesting audience. Half Deadheads, half students who were waiting for Prophet - the "hit" on the radio. Had to explain the boys might not play it. The fastest, most raucous Eyes I've ever heard and a Stella that still brings tears to my eyes. Compare the Eyes the next night at Rochester - gentle, lilting, airy. Hard to believe it's the same song. Shows the versatility of the band. Awesome website. Thanks for the reviews and downloads. Keep it up!! This was the single most fun show I ever attended (out of more than 60). Jerry was smiling most of the night, and playing his leads with an extra edge of energy and brightness. To me, the Eyes is the absolute highlight. What is also extremely interesting is the transition from Playin' into Eyes. Never heard anything like it before or since.